Health is linked—directly and indirectly—to the Deep Drivers of Change: Education, 21st Century Jobs, and Quality of Place. Healthier students achieve greater academic success and educational attainment. A healthier workforce is more productive, has lower healthcare costs, and makes Louisville more attractive for the growth of 21st Century Jobs. Healthier residents promote and expect a greater quality of place. Conversely, education and income influence length of life and quality of health during life. For example, low educational attainment is among the root causes of poor health so maintaining community-wide focus on raising education attainment will result in not only more educated residents but healthier ones too. 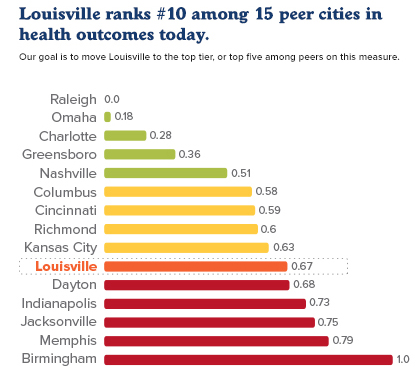 For the first time, this report assesses the health of Louisville compared with the 14 cities that have long served as its competitive peers. It utilizes a framework provided by County Health Rankings, a project supported by the Robert Wood Johnson Foundation, the nation’s largest philanthropic organization devoted to public health. To help identify Louisville’s most strategic health-related challenges, the Greater Louisville Project brought together an 18-member health advisory group, comprised of leaders from the public and private sectors. The inside pages of this report highlight these strategic challenges and present indicators the community can measure over time. This report identifies our most challenging health factors, including low educational attainment, unemployment, high rates of smoking and obesity, low access to primary care and poor air quality, and highlights the disparity among our neighborhoods. 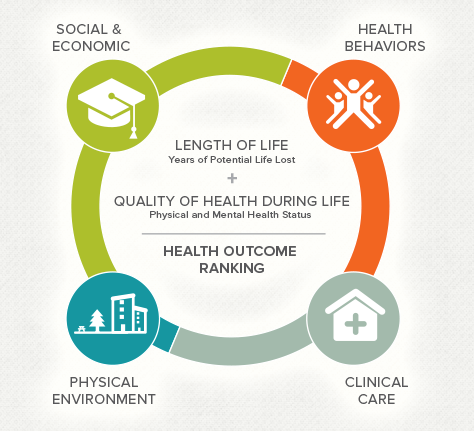 There is a connection between health and the Greater Louisville Project’s Deep Drivers of Change: Education, 21st Century Jobs and Quality of Place. Disappointing health outcomes such as low life expectancy and poor health during life can impact our prosperity and opportunities, and our competitiveness as a city. There are programs and policies underway, such as the Mayor’s Healthy Hometown Movement, JCPS Health Promotion Schools of Excellence program, and innovative employee wellness programs—but they are not enough. We must develop a shared health agenda and pursue “Health in all Policies,” in public policy, at the workplace, at the neighborhood level, and in our schools. We must consider health impacts during infrastructure planning and program investments. Together, leaders from healthcare, business, education, nonprofit and government must support programs and policies to improve our community’s physical health. In doing so, we will ultimately improve our economic health as well. As a community, we must accept responsibility and lead the way to a healthier future. We all have a stake in creating a greater Louisville, a healthier Louisville, a more competitive Louisville. 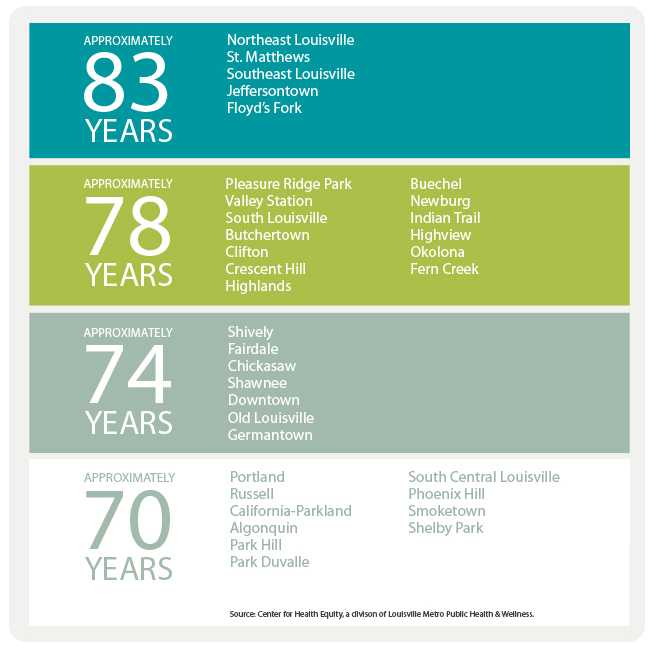 In the course of this work, the Greater Louisville Project reviewed the most recent Louisville Metro Health Equity Report (2011), which outlined sharp differences in health outcomes by income, race, and neighborhood. The chart to the left illustrates how social determinants such as low educational attainment, high unemployment, coupled with poor access to care and low investment in the built environment can impact life expectancy, by as much as 13 years across neighborhoods.